We stared with a few bags of polystyrene eggs sourced from the pound store. 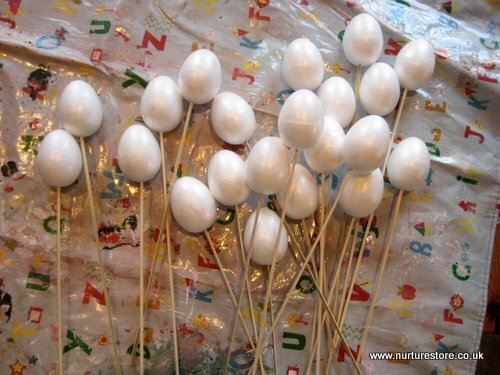 We spiked each egg onto a wooden skewer to make them easier to handle once we started painting. 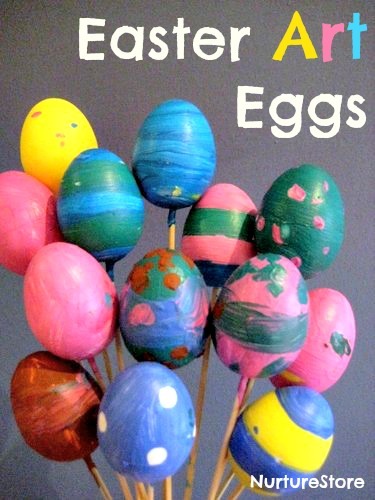 And borrowed an idea from our painted flower pots, using a cardboard box to hold the eggs while they were drying. because if you use water based poster paint, this is the difference it makes! 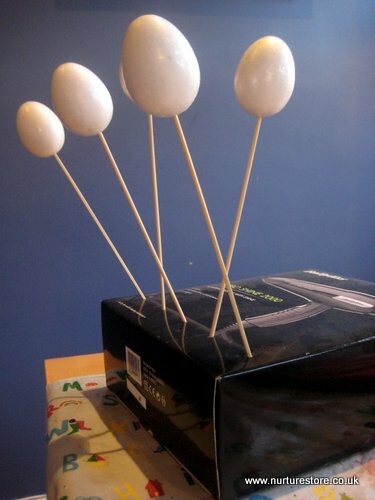 The wooden skewers made it easier to get the paint on the egg not our hands. 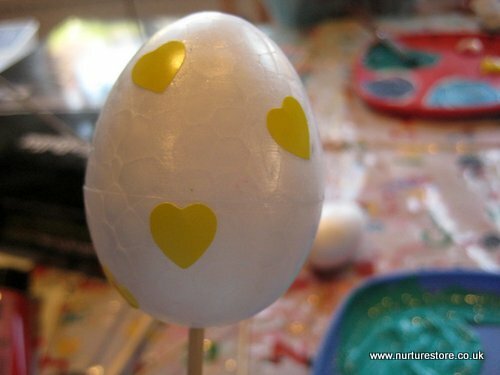 The children decorated their eggs in lots of different ways. They added stickers and painted over the top – so they could peel them off when the paint had dried and reveal the secret shapes. 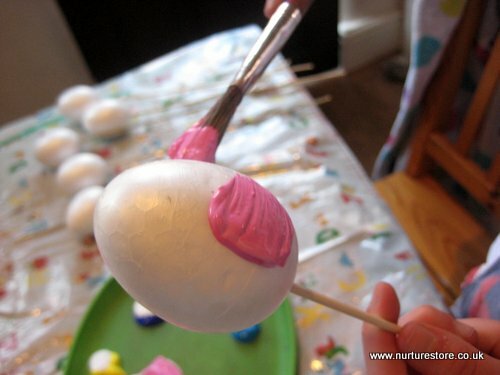 They also found the sticks made it very easy to twirl the egg and make rings with the paint. 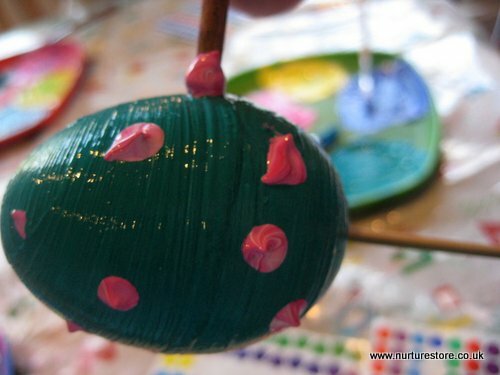 They used the other end of the paint brush to make polka dots. And also went for the more is more approach! The cardboard box invention was a great way to hold the eggs until they were dry. 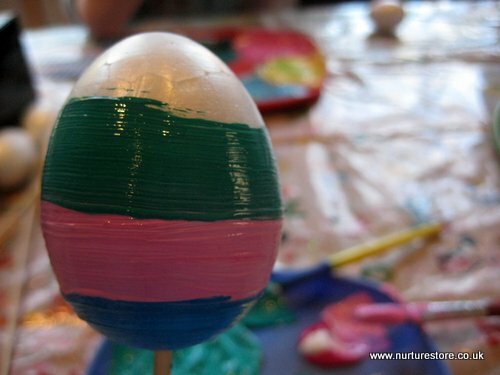 The painted Easter eggs look gorgeous still on their sticks in a colourful vase. I love how each one turned out differently. 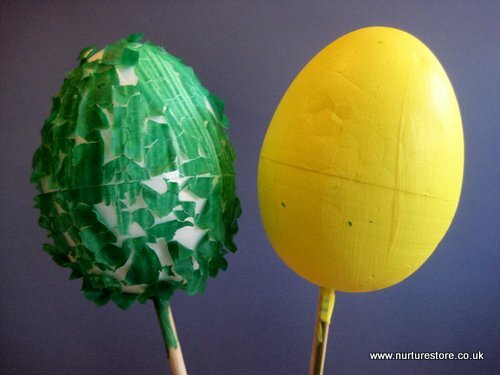 We might also take them off the sticks, add a ribbon loop (held in place with a pin) and hang some on our Easter tree with our heirloom Easter eggs. 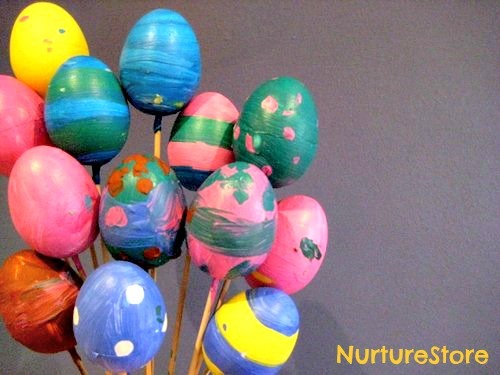 You could also use them in a Easter egg rolling contest, or hide them around the house or garden and use these Easter egg hunt clues to go on an egg hunt. 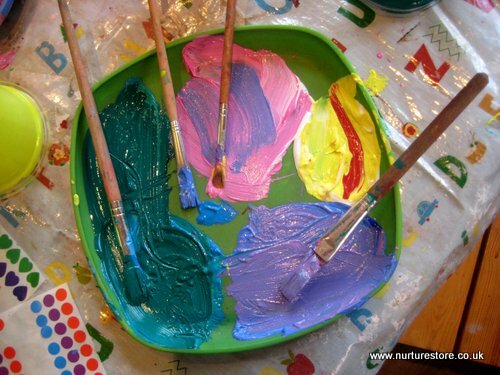 I love the sticks for the painting – I’ve run out of acrylic paints do you know whether the 50:50 PVA and poster paint will work effectively as would like to do this tomorrow? Not sure Cerys but maybe? I think using glue would help it adhere. Do a trial with one of them tonight? Oh that’s a shame Cerys – but yay for new paints! 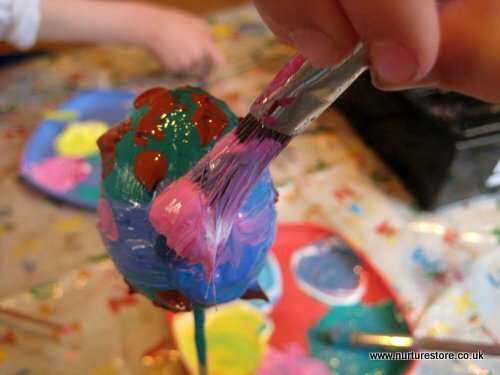 What a great idea to use sticks to make painting easier! 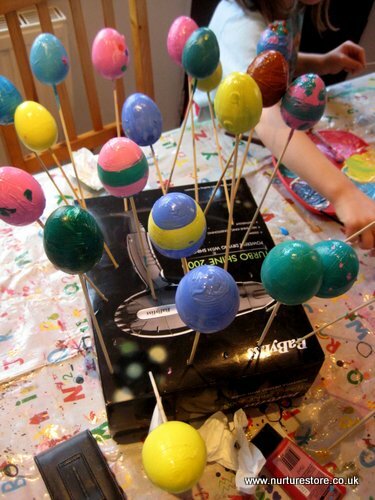 I am thinking about using skewers and real hard boiled eggs. Then painting them with humus (or mustard/mayo mix) and decorating with a variety of healthy foods, maybe shredded cheese, coconut shavings, shredded carrots, olives, relish. Do you think it would work? Taste ok for a snack? That’s a great twist on the idea Kris. I think so long as you keep the decorating items small and light they should stick on to the humus OK. ANd yes that combo (maybe not the coconut for me) sounds like a good savoury mix. Hope you’ll let me know who you get on! Those would look so cute stuck in a flower garden by the front walk. So cute.